To coincide with Mead Gallery’s John Piper exhibition, which includes several works associated with Coventry, we step out of the gallery to take a look at some of Piper’s lesser known excursions into the West Midlands. Opened by the Rt Hon. Lord Mills of Studley KBE, Pay Master General, in December 1960, Chamber of Commerce House is an increasingly rare example of architect John Madin’s once prevalent work. A major figure in Birmingham’s post-war development, Madin designed the city’s iconic Central Library (recently erased from the city’s skyline), as well as the Birmingham Post and Mail building (redeveloped), BBC Pebble Mill (bulldozed), the NatWest Tower on Colmore Row (levelled), and many others. Though several of his remaining buildings are protected (ie.Juniper House in Solihull; St James’s House, Frederick St, Birmingham), this Edgbaston property hasn’t been deemed worthy of a listing status. 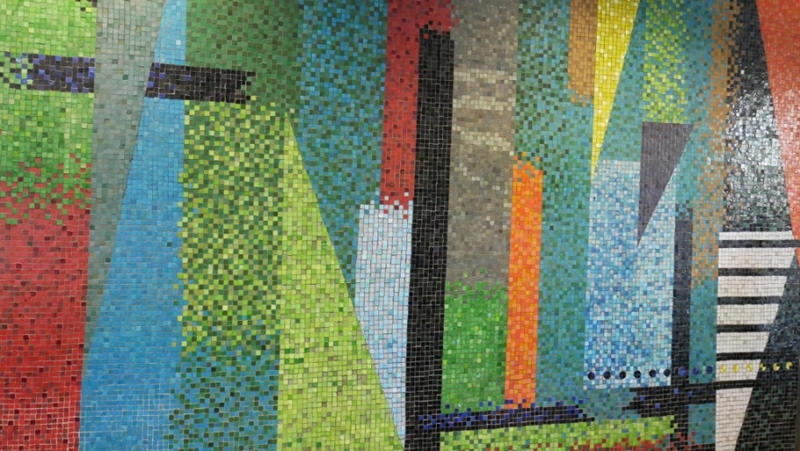 Close to Five Ways and home to Birmingham Chamber of Commerce, within the main ground floor reception hides a bright colourful tiled abstract mural by John Piper. 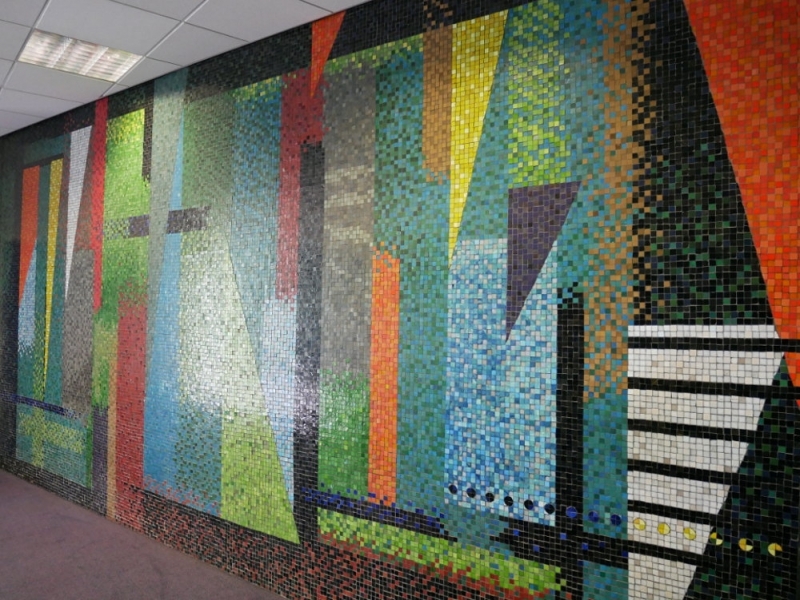 The flow of the building has clearly changed since Madin’s time, and as a result the mural is easy to overlook – especially when it’s partially obscured by leaflet racks and a chunky Star Trek charity pig! Yet it regularly attracts occasional inquisitive Piper fans, keen to see its jagged shapes. As the Mead exhibition concludes, Piper was never wholly comfortable with abstraction, and had rejected it by Second World War. This 1960s mural, however, appears to challenge that assumption. Though nothing like his Cubist influenced experiments, it’s nonetheless pure abstraction, and also uses a bright palette of primary colours – red, yellow, green. These are bold colours not typically associated with the artist (although as his amazing tapestry for Chichester Cathedral, installed in 1966, proves, he wasn’t adverse to bright shades and bold shapes). 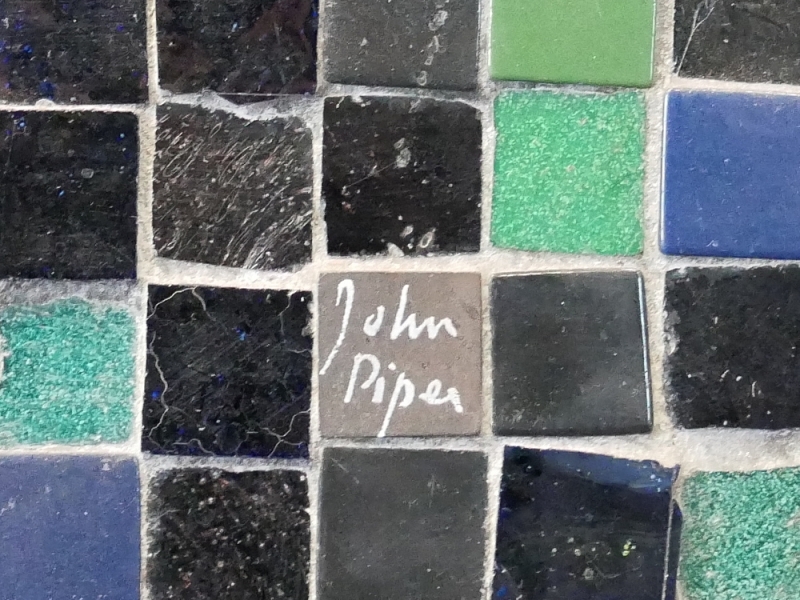 If you do get a chance to see it, look out for Piper’s signature on a small grey tile towards the bottom right-hand corner.